Fast, simple, and easy to fit. Can accommodate screens, plinths, storage etc. Can be carried in your car and stored in a cupboard. Carries a range of graphic panels. Fits any shell scheme profile. Independent seamless graphical cladding (which you own and is not returned to us). Choice of cladding … roll-able polyester panels, Foamex boards, or tension fabric. Saves much-needed floor space compared to a “pop up”. The shell-kit modular exhibition stand available for you to hire has been designed with a focus on simplicity, adaptability for different venues, and maximising available space while making a great impact. 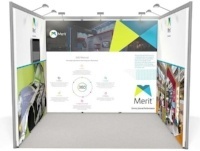 Your exhibition stand space can be transformed in minutes and clad with your graphics to create a seamless yet professional and eye-catching display. On every front, the system outperforms inferior alternatives like “pop-up” stands, while remaining cost-effective. 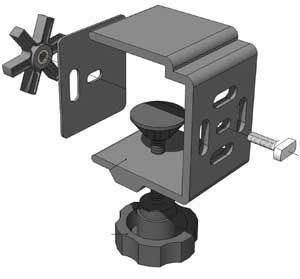 The key parts are a beam and connector – which join together with a brilliantly simple twist-and-lock action – and a specially designed clamp. The clamp can be fixed directly to any shell scheme, saving you time and removing hassle. This framework is then covered with your choice of graphical cladding to complete your stand and provide visual impact. Incredibly compact, the kit sits just 60mm away from the shell scheme wall, maximising your floor space and avoiding the kind of clutter that can interfere with customer engagement. Also, thanks to its unique design, the shell-kit can be broken down into manageable lengths for ease of transport. In fact, the average 3×3 shell scheme stand can fit in a bag over your shoulder and carried in the boot of your car!